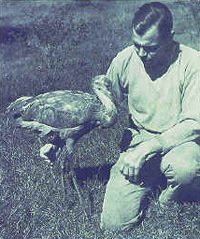 The NACWG recognizes that there are those within the wildlife conservation community whose body of work constitutes a major contribution to crane conservation. One of the functions of a group such as ours is to identify and celebrate those achievements that are remarkable within our area of interest. The NACWG may periodically choose to honor an individual who has, in the judgment of the group's board of directors, made such a contribution. The purpose of this award is to recognize those individuals whose efforts have advanced our ability to conserve a species, subspecies, or population of cranes in North America. Criteria for consideration for this award are long-term involvement with conservation of cranes through research, management, education, or application of biological principles to the preservation of cranes in North America. We have chosen to name this award after L. H. Walkinshaw because his life long pursuit of knowledge of cranes in North America epitomizes what we wish to express with this award. Nominations for this award can come from within the awards committee or can be submitted to the awards committee by the membership at large. The award itself will consist of a formal certificate/plaque and an object of art (photograph, limited addition print, sculpture etc.). The certificate may be incorporated as a part of the framed art work when appropriate. Nominations for the award should be submitted to the awards committee 6 months prior to the triennial workshop. Recipients will be announced at the business meeting or at the banquet held in conjunction with the workshop. 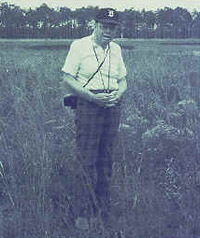 Dr. Larry Walkinshaw - the Father of Crane Biology. Battle Creek, Michigan 1942.